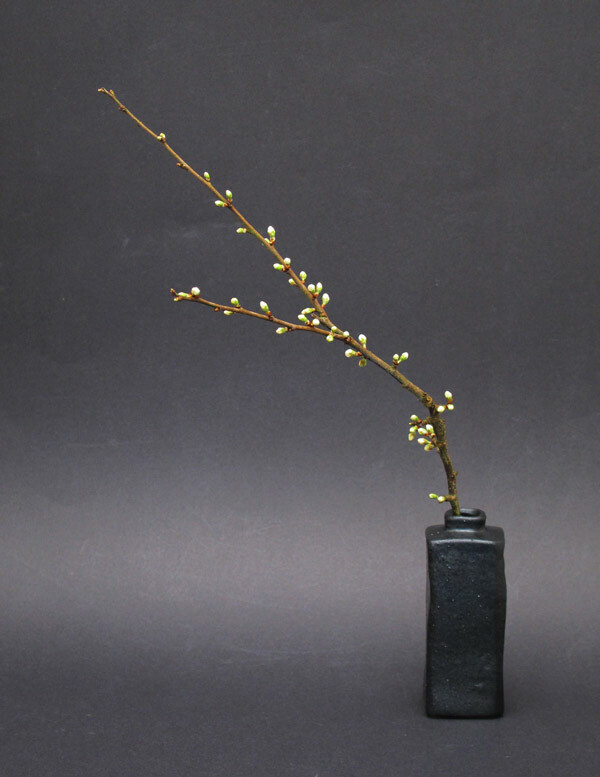 March 13, 2019 "Bonsai Shows 2019"
I will be attending the forthcoming UK bonsai shows in 2019, selling an exciting selection of Japanese items - suiseki, bonsai pots, display stands and rare bonsai books. March 5, 2014 "Japan Suiseki Exhibition"
On February 9-13, 2014 the Nippon Suiseki Association held a wonderful exhibition at the Tokyo Metropolitan Art Museum, the first time they have done so at this major venue. 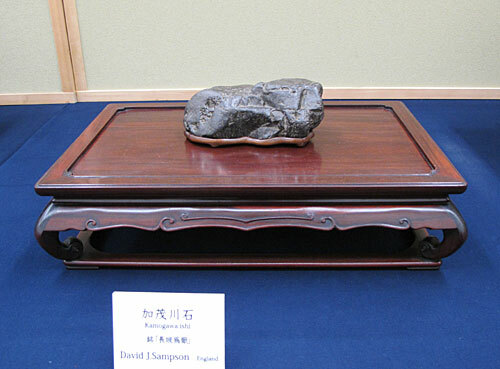 The exhibition featured many fine suiseki, including a number of very famous stones not seen in public for many years, all beautifully displayed, including some stones shown in tokonoma. 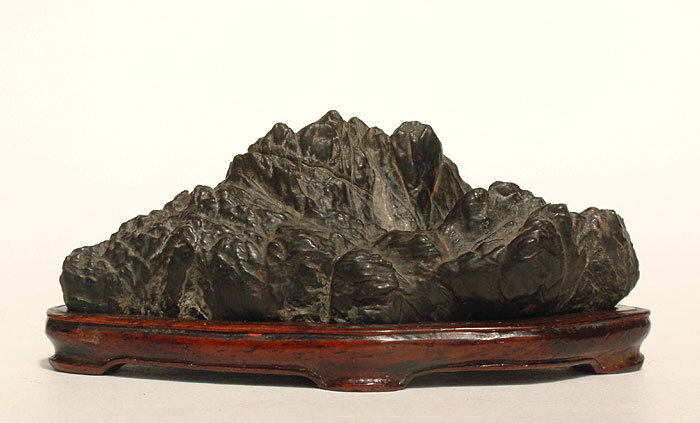 In addition to the suiseki, fine quality display tables, suiban and doban were also on display for visitors to admire and study. 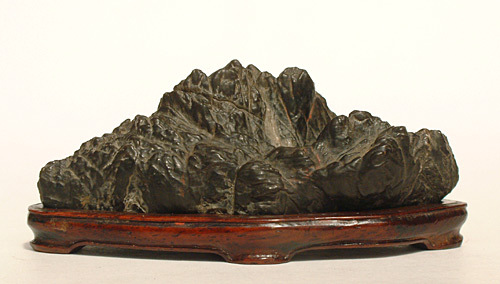 I was delighted when a suiseki from my personal collection was accepted to be included in this prestigious exhibition - it is one of my favourite stones, a Kamogawa-ishi with a plateau and series of steps. The stone has a very desirable shape and a beautiful patina, the latter developed over its many years of appreciation as a suiseki, and was previously owned by Kamia Yoanken, a notable Kyoto based suiseki collector of the late 19th - early 20th Century. The stone as seen in the exhibition. 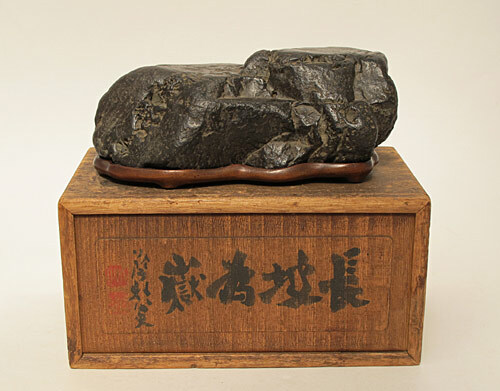 The stone (18cm wide) sat on its old kiri storage box, with Yoanken's writing and seals. I am sorry to say that today is a sad day for me, it marks the fifth anniversary of the passing of my late wife, Lorraine. In her memory, I wish to share with you the Furuya-ishi she gave me for my 40th birthday, needless to say, this suiseki is of the deepest sentimental value to me, I will always treasure it and the happy memories it brings. Hello and welcome to my News page. This is something I have decided to include on my website so I can be a little more chatty and informative as to my suiseki activities. Apart from the News page, regular visitors to the website may have also noticed a new look to it, nothing too drastic as I like the clean uncluttered look, just a few subtle changes to its appearance and more in keeping with how the internet is viewed these days. I'm very pleased with the result and must take this opportunity to say a big thank my good friend Joe Davies for his technical help, input and encouragement. Without Joe's help and guidance, both now and in the past, I'd still be in the dark ages of not using the internet.... mind you, I'd have more time on my hands ! What better way to mark the opening of the updated website, than to illustrate this first post with a photo of opening buds (visual metaphor intended !) on a simple Sloe branch planting I created, please click and enjoy it. .... many thanks for joining me.